Ron Sumner has worked as a professional illustrator, printer, painter and teacher. His paintings have won numerous awards. 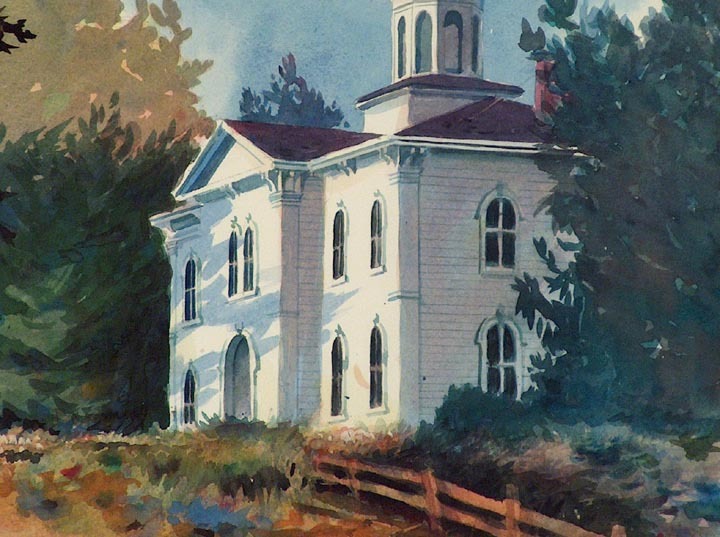 He studied under famed San Francisco Bay Area watercolorist, George Booth Post, and his works have been exhibited in the Triton Museum in Santa Clara. His paintings are of local coastal scenes, harbors, boats, lighthouses, sea life, birds, and coastal farms and farm animals. This is a whimsical painting from his most show in recent years at Bodega Bay's Local Color Gallery recalling our Bodega's claim to fame, the Bodega School House used in Alfred Hitchcock's 1963 film The Birds.